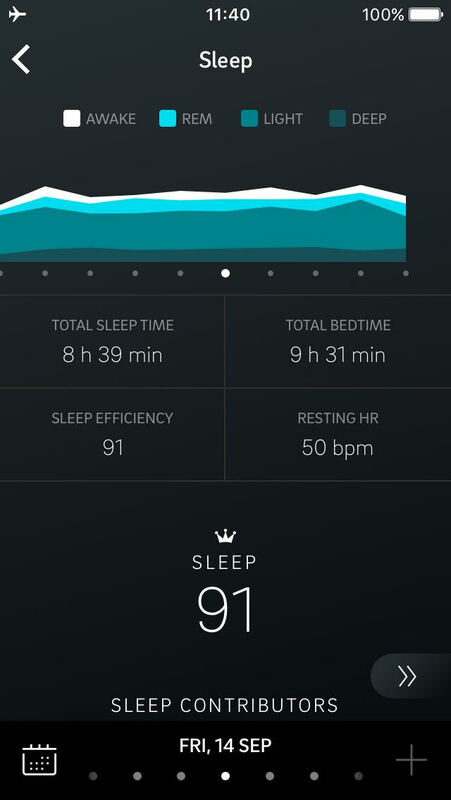 I like my sleep. I know the importance of quality sleep for my health, and I also appreciate that we spend over a third of our life in our bed. As a result, I recently purchased - what I regard to be - the healthiest bed and mattress in the world, the Samina Mattress System. Though some may argue that it could also win the title for the most expensive mattress in the world! The final price was over $10,000. Crazy? Perhaps! But then again I think people who spend $5,000 on a TV or a fan new appliance are crazy. Each to their own I guess. At least I know I will be spending my nights sleeping on the best mattress setup that money can buy. So what is it like sleeping on a $10,000+ metal free mattress, made with only the highest quality natural organic materials in the world? Well after 2000 hours sleeping on my Samina Mattress I plenty of thoughts and feedback points that I'm going I'm going to reveal all in this review. Grab a drink, make yourself comfortable and let me share my thoughts with you. First Things First - Why Spend So Much On A Mattress? If you have read my article titled 'How To Choose A Toxin Free Healthy Mattress' you will know the answer to this question. Not only is our mattress the place we spend 8-10 hours a night in close contact with, but it's the most important item in our house when it comes to health. Sleep is when the body grows, heals, fights off foreign bugs, regulates body fat levels, solidifies new memories and allows us to combat an ever toxic world. Unfortunatley most mattresses int he market are not conducive to health. Instead they're designed for comfort and mass market appeal. Stop and think for a moment, how many people do you know that would buy a mattress based on it's health properties? I have written about the dangers of flame retardants in my article Are You Being Exposed To Dangerous Flame Retardants? In this article I show how flame retardants such as PBDEs are found in alarming high levels in mattresses. Unless your mattress is made from organically certified materials (such as organic cotton and will) it may be contaminated with pesticides such as glyphosate (25% of the worlds cotton is GMO and laced with pesticides). Inhalation and skin contact with these poisons is linked to a wide range of health problems including autism and cancers. Worst, the synthetic foams used in our mattresses are filled with flame retardants, made using harsh chemicals, restrict adequate air flow and are a haven for dust mites. All this leads to skin reactions, off gassing causing headaches and SIDS in babies, allergies and asthma and mould growth. It may be comfy, but it's far from a healthy environment to sleep on. 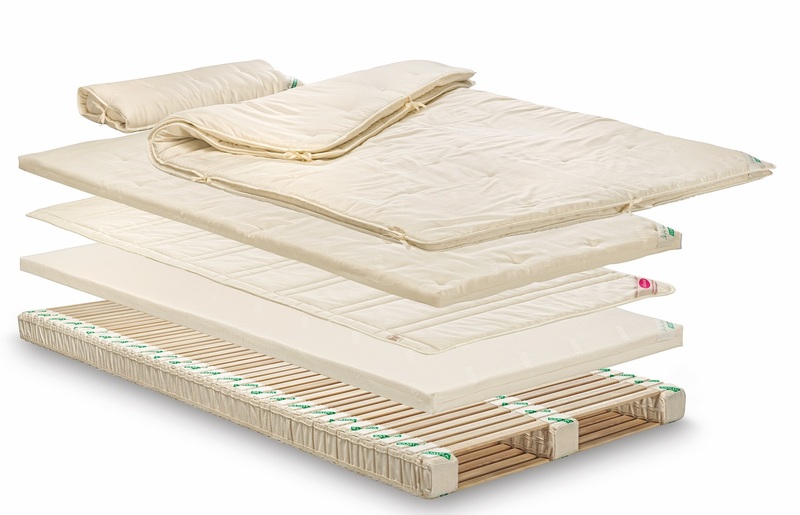 Glues and polyurethane foam used in mattress manufacturing are high in volatile organic compounds (VOCs). Exposure to these VOC's have been linked to asthma, liver problems and even cancer. The newer the mattress, the worst the exposure - this is why a lot of manufacturers recommend 'airing new mattresses' out before sleeping on them. What they're not telling you however, is that this chemical off gassing can take months to normalise. If you are laying on a chemical filled mattress for 8-9 hours a night, your nose and mouth are extremely close to the surface of the mattress. A lot of mattresses feature inbuilt metal spring coils. These are marketed as giving more support with less partner disturbance. But these metal springs can act as antennas for non-native electromagnetic fields (examples of devices that emit harmful nnEMF include smart meters, cell phones, cell phone towers, wall wiring, wifi routers, appliances, baby monitors etc). For an in-depth look at the hidden dangers in mattresses, I highly recommend reading my article How To Choose A Toxin Free Healthy Mattress. When you start to uncover the horrible things that are found in most mattresses, you will soon start realising why I spent as much as I did on a healthy, toxin free mattress! Especially because I value my health (and sleep) and that of my partners. Also, we plan on having children in the future, no doubt these children will spend time in out bed, so this was more reason to make a big financial investment in a quality mattress. It just means they won't have a big TV to watch movies on. Priorities I guess! Ok enough about the why, let's look at the good and bad about this premium mattress. The Samina 'mattress' is a little different to your typical mattress. 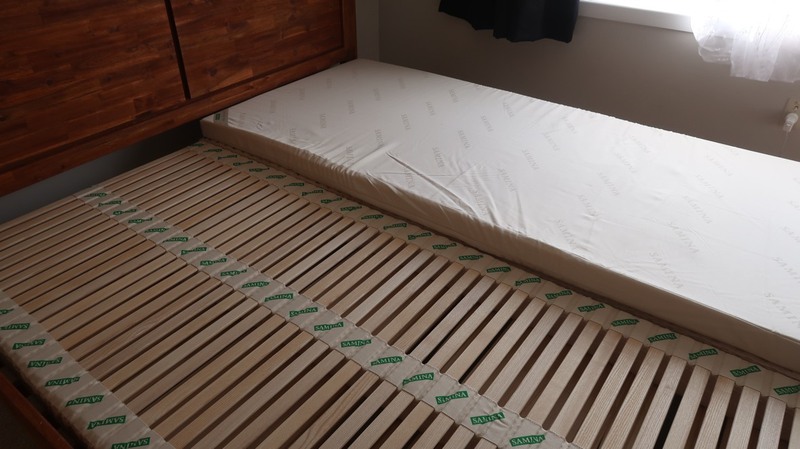 Instead of one solid mattress - encasing springs, foam and dense supporting structures - that is designed to sit on a slat bed frame, or a solid bed base, the Samina 'mattress' consists of multiple layers. In fact the company refers to to their product as a 'system' instead of a bed or a mattress. I personally do not own a Samina bed frame (more on this later) instead I have the Samina system which is held up by my own wooden bed frame. You do not sit this 'mattress system' on a slat bed frame, or on a solid bed base, nor is the Samina 'mattress system' designed to sit directly on the floor. This is because the base 'Orthopaedic Flexible Slat Frame' (as shown below) acts as the base supporting structure of the Samina sleep system. This slat frame is designed to be freely suspended, and provides support for the spine, whilst also having enough integrity to withstand a lot of force. I weigh ~100kg (~220lb) and this slat frame was strong enough to hold my weight whilst I jumped up in down on the one spot. This patented flexible slat frame takes the role of the 'slats' or base found in your typical mattress. 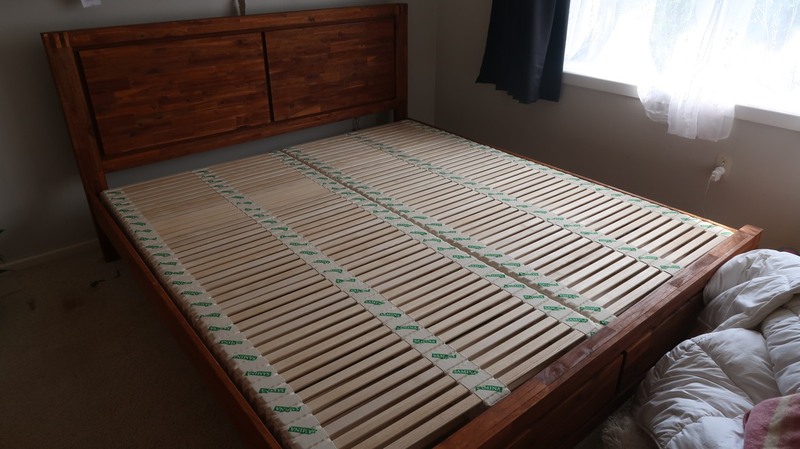 Remember, the Samina slat frame is suspended above the ground (using the Samina bed frame, or a standard bed frame with the slats removed and a few adjustments made) so that the core support is coming from this slat frame. It sounds crazy, but these wooden slats on their own are quite comfortable. If you watch the video part of this review you will see my partner's reaction when she lays on this frame without the rest of the layers. Her response was typical of mine and many others I witnessed when they tested the Samina bed at the Bulletproof conference. Of course, however, this is only one part of the sleep system! But it does a great role of evenly distributing pressure across the sleepers body. When you are laying directly on this slat frame, it is clear that your body is in contact with every slat - there are no hard or soft spots that take all the weight. You don't find yourself laying on your back and only having the head, shoulders, bottom and feet in contact with the slat base (such would happen on a poorly developed mattress) - instead the back of your neck, your mid and lower back, your hamstrings and calves are all in contact with the slats - showcasing the support that this slat frame is providing. Now to be clear - if you had a mattress that was very soft, you would also have contact points right down the body, but if the mattress was too soft, with too little support, you would also sink into the mattress causing too issues: 1) poor spine support and 2) being encased in the mattress around the body (trapping heat and moisture buildup). A good test to do when mattress shopping (and this applies to all mattresses, not just the Samina system) is to lay on the mattress as you intend to sleep, then have someone crouch down eye level to your spine. In a well designed mattress, your spine should be flat - with even support across all parts of your body. This is what happens when you lay on a Samina. Working up from the Slat Frame Base, the next layer is the natural rubber latex mattress. This is about 3 inches thick and is designed to cushion the wooden slats below. Plus the rubber latex has it's own benefits that I will cover in the section below. You can see the rubber mattress sitting on top of the slat frame. The next layer would be the Lokosana Grounding pad. This is an optional extra and I didn't purchase it when placing my order. I will cover the grounding pad in a little detail below, but as I haven't used it I will not be reviewing it. For my setup, the next layer was the climate regulating wool pad topper. This is pure sheeps wool and forms the top layer of the Samina sleep system. I explain the benefits of having wool close to the body in my article on mattresses HERE. The wool pad topper sits on top of the rubber latex which sits on top the the slat frame. 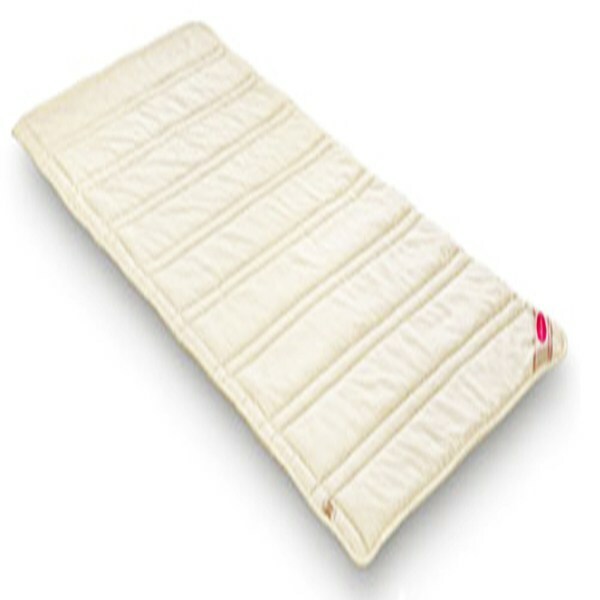 The wool pad is slightly thinner than the rubber mattress and adds a natural layer of pure organic wool to help create a dry and warm sleeping environment. Unlike the slat frame and the rubber mattress, the wool pad comes in one piece. Meaning you will not have any 'cracks' or splits in your bed (but you still get the benefit of effectively sleeping on your own mattress - more on this later). On top of this I then have a wool mattress protector (I went with the Samina protector), and then of course you would have your pillows and duvet. I purchased three Samina Pillows from their extensive range (you can see all their pillow options here). I got one of their extra slim pillows (that I use when sleeping, I love this pillow and take it with me travelling when I'm not at home) and 2 of their standard pillows. I think these are the delta pillows. My wife uses this as her main pillow when sleeping. It's too bulky for me. 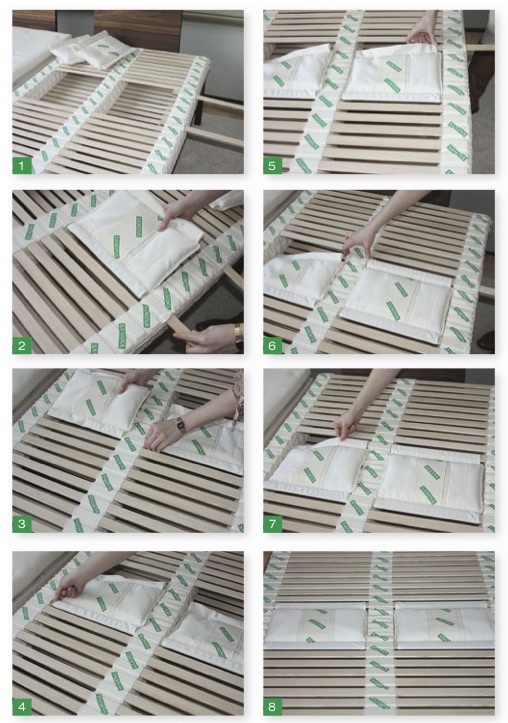 The multi-tiered structure of the Samina mattress is definitely very neat, and provides a lot of support to the sleeper, but the real appeal to Saminas product (at least in my opinion) is the quality materials they use (and the toxic materials they don't use). This was the main reason why I forked out a big part of my years income to buy a bed. Healthy, natural, toxic free materials. Firstly, we know what's not in it. There are no synthetic flame retardants (wool is a natural flame retardant). There are no synthetic foams. There are no VOC's used in the glues or fibres of the products. There is no metal used in the mattress system (or the bed frame if you choose to go with the Samina frame). So what is the Samina system made of? Not only do they only use the best quality natural materials, they have all been minimally processed and sourced from the best suppliers. There is no green-washing going on here. I guess the price tag reflects that (I often wonder how so called natural and organic products can be sold at rates comparable to their non-organic/synthetic counterparts - usually when you look into the products used, it is the bare minimum to get a certain label). Samina have gone above and beyond when it comes to sourcing their materials. In all honesty, they could have taken a few short cuts and I would still view this as the healthiest mattress in the world, but they haven't, and that simply reinforces my satisfaction of knowing I am sleeping on something that will not do my health or sleep any harm. The Samina slat frame is built using ash wood in it's natural form (it hasn't been treated with harsh chemicals) combined with natural rubber to create the flex. No issues here. Even though the cotton used in the rubber mattress is not in direct contact with our body, it is still in close proximity to the body, so organic cotton is the superior option here. Wool pad topper (and also the Samina duvets) are made from organic cotton fabric and virgin sheeps wool. And this isn't any old wool. I was told by the team at JustHealthySleep that the wool used in the Samina sleep system is sourced from Merino sheep on a German farm that has been selected for it's quality wool, but also the minimal intervention that goes into processing this wool. There are no harsh chemicals used in the wools fibre processing (like most wool, even organic wool can be processed this way I believe), and machine use is minimised. 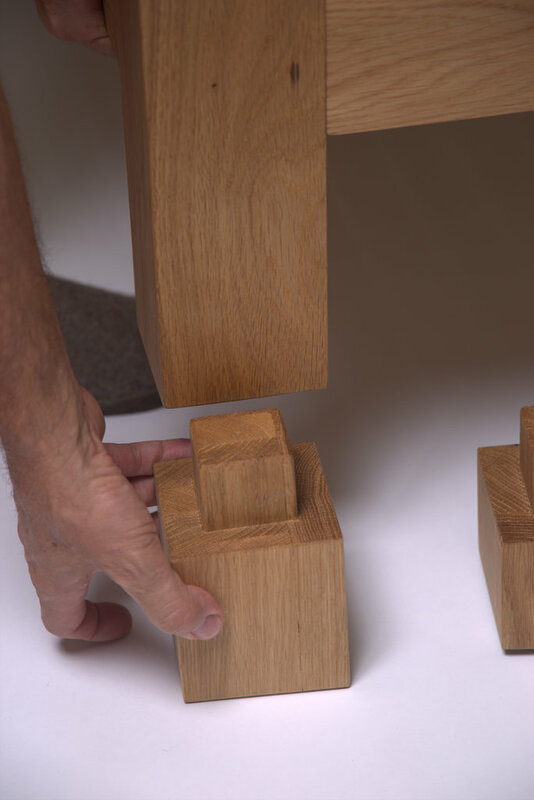 Everything is done by hand using a very traditional approach. Again - this may be over the top for some people, but the end result is an extremely high quality product that you know is going to be very safe for you and your loved ones. Our wool is washed gently after shearing, before it is carefully processed into woollen fleece and fabrics. Our solid wood is used untreated. In industrial production, the natural properties of the raw materials can be destroyed in mechanical operations. We rely on the power of nature - and a gentle, manual production process to preserve it. Only then can the valuable properties of the materials used optimally unfold their special effect - and we offer a product that allows you to sleep in its purest form: healthy, ecological and sustainable. The Samina pillows vary between the product range, but they may consist of virgins sheep wool, natural rubber and organic cotton. Though there are particular pillows in the Samina range that contain organic grain fibres and pine shavings. I don't have any experience with these pillows. Personally, I couldn't be happier with the choice of materials Samina has used in manufacturing their mattress. I learnt a lot about the products that go into mattresses making when researching my article on healthy mattresses, and I must admit, the more I learnt, the more I thought to myself that I will never find the perfect solution when it comes to toxic free materials. All that changed when I discovered the Samina product. The great thing about having such quality materials is not only the eliminated toxin exposure, but also it makes an environment that is unsupportive for the growth of nasties such as dust mites. When it comes to diet and health, natural is usually best, and this rings true with mattress materials as well! Other than the quality (healthy) materials used in the Samina bed, and the support my spine receives from it's patented designed, there are two standout features that I love. You would have noticed above that the mattress system is split in two. There are two halves when it comes with the flexible slat frame, and two rubber mattresses that sit on top. The only inter-connected part of the mattress is the top wool topper, and that is just wool and cotton fabric - it is not going to transfer movement across a bed. This means if one of you is a light sleeper, or is having a bad nights sleep tossing and turning, that movement won't be felt by your partner on the other side of the bed. 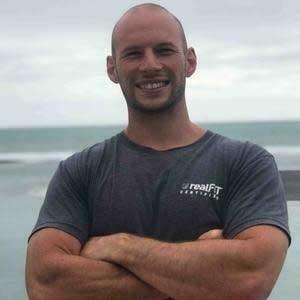 I have written extensively on ways to improve ones sleep on my site. One of the fundamentals needed for a quality nights sleep is to minimise distraction. This distraction could come in the from of light, the need to pee, sounds, temperature swings and of course movements. If your partner wakes up to go to the bathroom, or wakes up from a dream, or maybe they are late coming to bed, ideally you don't want to be woken as a result (and vice versa). Sure you could go and sleep in another room in your own bed (I have done this! My sleep was great, but it wasn't the best for our relationship), otherwise you are going to be pulled down by your partners poor sleep. And this is where the Samina system shines. 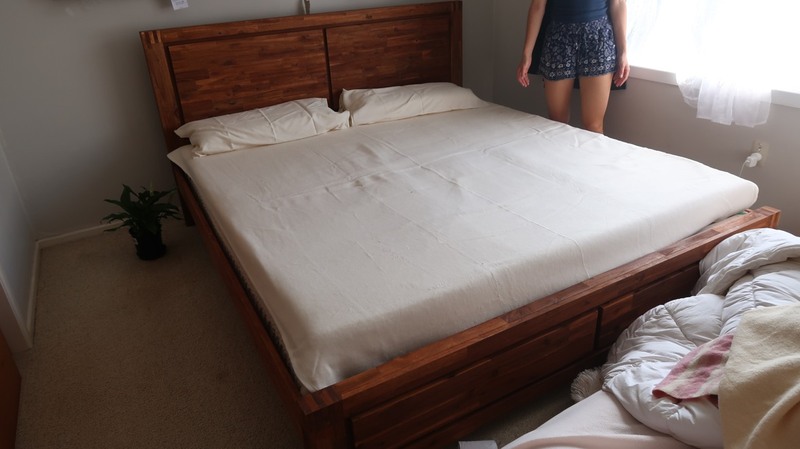 If you (or your partner) makes a lot of movement, there is very minimal movement detected on the other side of the bed. Sure it's not 100% perfect. If all 100kgs of me jumped on one side of the bed, I'm sure my wife would notice! But it's the best solution I've found that allows both of you to sleep in the same bed! It really is that good! In fact, recently we stayed at a friends house in a normal mattress. We were both noticed how sensitive we were to the other persons movement. To be honest we didn't sleep very good at all that night and it does make me wonder how much we have adapted to our low partner disturbance Samina bed! I touched on this earlier, and I don't want to spend too much time on it, but the Samina mattress system - and the bed frame if you purchase that (I didn't due to the higher freight costs) are 100% metal free. If you are concerned about the dangers of nnEMF - and you should be - then you need to minimise the metal in close proximity to your body when sleeping. Low partner disturbance was one of my favourite features, the excellent airflow that the Samina mattress allows is the other. Hot, stale air is bad for a good nights sleep. Cool fresh air is best when it comes to your sleep environment. Sure you may have a fancy air filter, with a fancy fan and air conditioning unit creating the perfect room temperature in your bedroom, but what about the air immediately around you? And what about the air underneath you? Anyone who has slept on a pillow top mattress in the middle of a hot summers night will know how a bad mattress can ruin your sleep, leaving you feeling suffocated. They may be comfortable when you first lay down (or when you test it in the shop) but it's not helping you get the best nights sleep. You need a well ventilated room, without excess heat or humidity. This is where the Samina system works it's magic. Not only is the mattress system free floating (not sitting on a base), but the mattress components are only a few inches thick (but you still get all the great support from the slat frame below). This allows air to get closer to your body - especially underneath. Better yet, as the materials used in the Samina mattress are all high quality natural products, they help with the air flow and also help control moisture levels. For example - wool is great at drawing moisture away from the body and and regulate humidity levels close to the body. Helping you stay cool in summer and warm and winter. At the time of writing, I haven't used my Samina through a really hot summer (my Samina arrived at the end of summer, it's now spring time here in New Zealand) so I can't say for certain how good this works, but after spending a night in our spare bed (to compare it too the Samina) I noticed how stuffy I felt when sleeping under the same blankets. Given I sleep hot (i.e, sleeping naked with only a sheet and a woolen duvet on me in winter when my wife has wool PJ's and 2 extra woollen blankets on!) I'm pretty keen to see how well the bed keeps me cool come summer time. Sweating While Sleeping: We all sweat as part of our natural detoxification especially when we sleep. 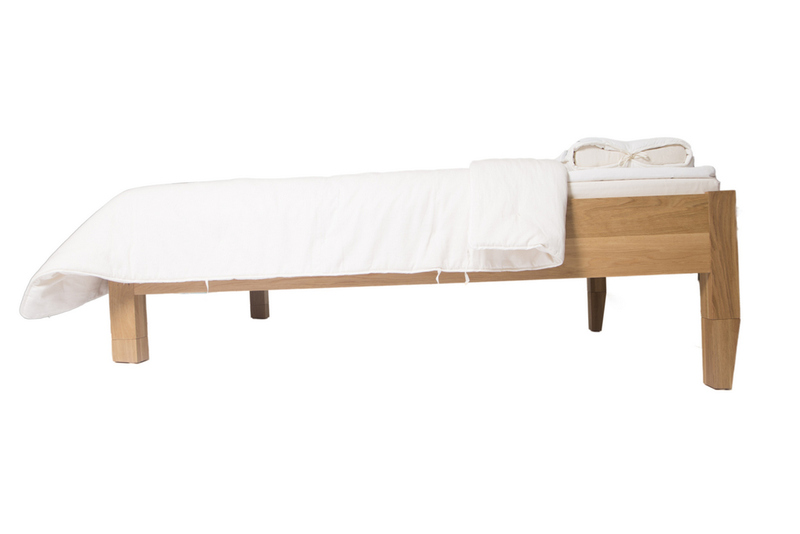 SAMINA has an open air design like no other bed. With open air circulation, breathable layers, and natural wool materials, the right conditions exist to help you sleep dry and not have your sleep disrupted because you are sweaty. According to the results of a study conducted by the University of Leeds, wool bedding helps normalize sleepers’ temperature noticeably more than feather, down or polyester fibers. The humanely harvested wool used exclusively in SAMINA bedding products is the sweaty sleepers answer to overheating while sleeping. We describe this phenomenon as “self regulating” especially because two different people sharing the same bed and bedding can maintain their individual body temperatures and sleep more comfortably. In our experience, many couples suffer a classic conflict over temperature in bed and SAMINA’s wool bedding materials help couples sleep together again. One final point I should mention is around the ease of rotating and airing out the Samina Mattress. Instead of one solid mattress, the Samina mattress system is split up into various layers as outlined above. This makes rotating your mattress (which you should do regularly) very easy. One person could do this on their own. Also, it means you can easily air out the wool pad and rubber mattress should you want to (Samina recommends doing this for best results). Even rotating the slat base is an easy process, and something that I have already done 3 times in the 7 months since I've had my Samina. Good luck doing all of this with a conventional bed and mattress! 2. To show people what options Samina does have. Samina's bed frames are very nice! High quality timbers, well made, free of harmful glues and metals, finished with natural oils etc. However if you live on the other side of the pacific ocean to wear the US Samina warehouse is located, freight becomes a financial hurdle (though it is possible, Samina has shipped their frames to customers in New Zealand and Australia). 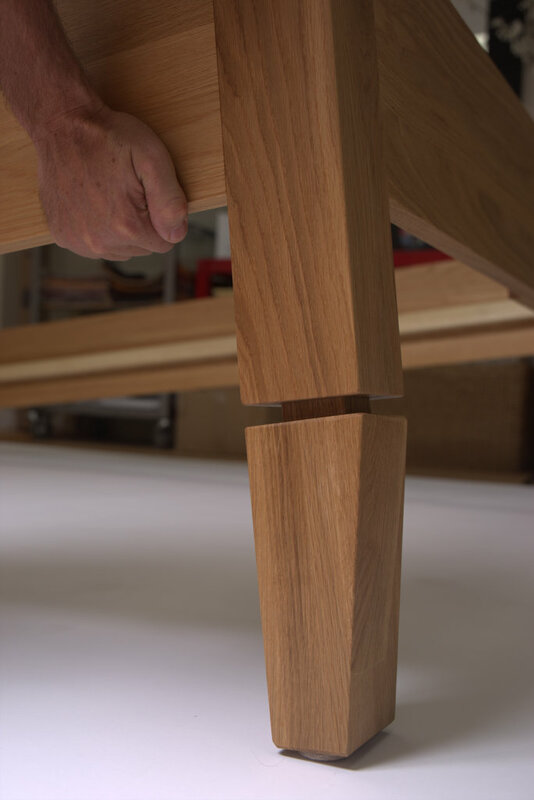 You can see more about the natural bed frames and the craftmanship that goes into them on THIS page. Samina have recently released their new inclined bed therapy frame. If you're not familiar with Inclined Bed Therapy (IBT) you can read my article on it here - Inclined Bed Therapy: A New Angle on Brain Detoxification. Samina IBT frame with adjustable feet heights. 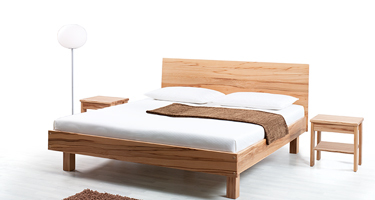 If you are looking at saving money, then you could purchase a standard slat bed frame and make some modifications. This will take a few hours of your time, and you will need some screws (there goes the metal free frame...) a drill and some know-how, can do attitude. In theory you could sit the Samina mattress direct on top of a slat bed base (we did this for a week before we moved into our new place), but you're not going to get the full benefit out of the mattress, and it's going to be quite a firm feel. Like the Samina frame, I currently don't own the Samina Grounding Pad (it's on my shopping list!). So I don't have any experience with it to share, instead I will simply share the information about the grounding pad that is on the Samina website. Grounding: The Lokosana® Grounding Pad is an essential element to the SAMINA Sleep System. Because we are bio-electrical systems living on an electrical planet. SAMINA came up with a way to ensure the Lokosana® Grounding Pad would improve quality of sleep through earthing and the stabilization of natural magnetic fields. 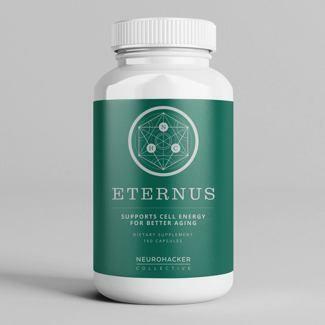 Based on research by the Max Planck Institute for Biochemistry, positive free-flowing electrons in our bodies have been linked to inflammation, aging and other chronic conditions. It especially interferes with our natural sleep rhythms. Grounding your body at night while sleeping, the body is restored to its normal electrical state. Samina have quite an extensive range of sleep and mattress related products, including their bed frames and grounding pad mentioned above. An extensive range of pillows (with various shapes, sizes, and materials) and their nursing/pregnancy pillow. There own duvet/comforter. This is a wool/organic cotton blend. With different thicknesses for different seasons. Bio-Ceramic Bedding - this is a cotton/bio-ceramic yarn blend that helps regulate heat and humidity beyond that of the mattress whilst also releasing far infrared heat into the body at night. I haven't used this but it looks neat! Bed Accessories such as a reading recliner and support wedges. Though I don't have experiences with these items (other than the pillows) I would like to oneday get a hold of a few of these items (including the duvets, the bio-ceramic bedding and the reading recliner!) and I will update this review with my experiences. Should you have experiences with these items (and even the Samina mattress as a whole) please feel free to leave your feedback in the comment section below. I would love to hear it and I'm sure others would as well. There is no point glossing over the fact that the Samina mattress is expensive. This is not your mass produced 'sign up for a 10% discount code' mattress that is being churned out in a production line. This is the Rolls Royce of mattresses, everything about it screams 'premium quality'. From the traditionally processed virgin wool used in the mattress, to the individual cross-stitch points in the wool pad (instead of stitched seams that create thermal gaps). But any premium product comes a premium price tag. Obviously the Samina products are not for everyone. It takes a consumer who is passionate about their health and sleep, and who can afford such a high ticket item. If you are someone who can't justify the $1 extra price tag for organic broccoli, then there is no way you are going to spend $10k or more on a mattress. But if you are this person, I am surprised you have read this far! So we know it's pricey, but exactly how much is it going to cost to upgrade your bed? Unfortunatley the prices aren't listed on the US Samina Website. If you are interested in learning more about the Samina product range, give Claus or Denise a bell over at https://justhealthysleep.com/. Grounding Pad $2400-2700 per person depending on bed size. Though again, please don't take these numbers to the bank! Please check with the US Samina team at www.JustHealthySleep.com for the latest pricing. You may have seen the adverts for the 'mattresses in a box' all over social media. Though the Samina mattress isn't quite as small when it comes to shipping, it is still possible to get it sent across the world. And it's a hell of a lot easier than shipping a conventional mattress that is for sure. When my Samina super king mattress system arrived in New Zealand, I think I received 5 or 6 boxes. These were rather big and bulky boxes, though they weren't too heavy thankfully. But it did add an extra $1000 to the purchase price... Remember this was without the bedframe. If you live in Europe or USA you will be in a much more fortunate position - both in regards to cost and also shipping time. I should point out I also had to pay import duties and taxes. This turned an already expensive item into a very expensive item! I am told that Samina have shipped their products to all corners of the world, including New Zealand, Australia, Hong Kong, Europe (where the company is based) and all over North America. It did take a week or two for my mattress to arrive and get through customers, but that was too be expected. Putting the bed together was a walk in the park. 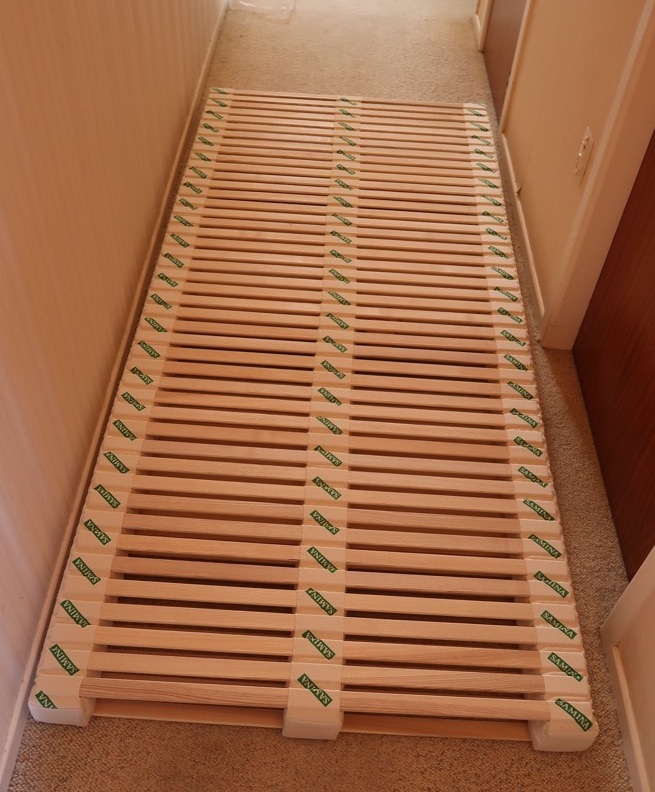 The tricky thing was modifying a standard slat bed. If you are serious about getting a Samina Mattress, consider getting the bed frame with it. It will save you time and stress, and it will complete the package knowing you have a high quality, metal and chemical free frame. For the complete unboxing/setup process, please watch the video where I walk through the setup. The $10,000 Question - What Is It Like To Sleep In? The section you have all been waiting for - what's it like, and is it worth the price tag? I take my health very seriously, and I want my home to be as healthy as possible - especially as my wife and I would like to start a family in the future and raise them in this house. Knowing what I now know about mattresses, the fact that I go to bed every-night in a bed that is free from harsh chemicals, pollutants and metals is very pleasing and worth a lot of money if I had to quantify it (it was my long search for a healthy mattress that led me to Samina's products). The bed itself is very comfortable when you lay on it, but what bed isn't these days? If you go into a furniture store and lay on a few display beds, they are all comfy. So that is no real selling point for the Samina, and to be honest, it shouldn't be anyway. You shouldn't buy a mattress based on how comfy it is when you lay on it for 10 seconds. It's like buying a car based on how comfortable the seat is, but not looking at the engine size, fuel efficiency or safety rating. Knowing that the bed has been designed for optimal spine support is reassuring however. There is very low partner disturbance. In past beds if my wife was having a light sleep it would impact my sleep, to the point where I would get up and sleep in the spare room. This hasn't happened since we started sleeping in the Samina. Don't get me wrong, it's not 100% 'disturbance free', but those little movements that feel like you have an 'elephant next to you (my wifes words, not mine!) are not noticeable with the Samina. This may sound silly, but it feels like its well ventilated. As in I don't feel like it get's hot and stuffy under the covers (though there are special exceptions... ;-). 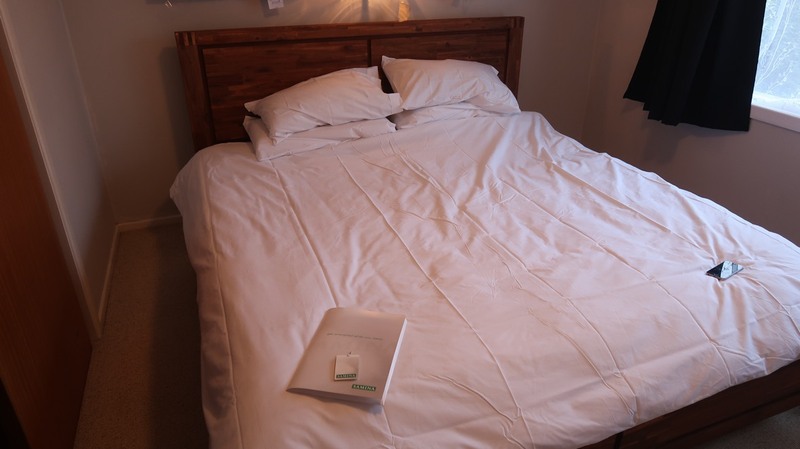 I haven't tested it though the heat of summer yet, but after comparing the Samina Bed to an Ecosa mattress we have in the spare room, the Samina definitely feels a lot more 'airy'. Which is a good thing. Rotating and airing out the mattress is very easy. I've done it a few times in the past 6 months. If I had a conventional solid mattress this would not be happening! My wife and I like our space when it comes to sleeping, yet she is a creeper and would tend to push me out of the bed at night... but I have noticed since we got our Samina King bed, this doesn't seem to happen. Whether it's the slat system or the much larger size I'm not too sure (maybe it's because we're now married :P) My wife has also noticed the difference, she thinks it is the independent slat systems that keep us in our half of the bed. The mattress system is on the firmer side. Our previous mattress was medium/firm, and the Samina is definitely firmer than that. Some won't like this - if you like super soft mattresses you will struggle in the Samina. In the first few weeks sleeping on my Samina I would occasionally wake in the night and think 'this bed is hard'. My wife reported the same thing, and though I am now used to the bed, she occasionally comments that the bed is a little firm. I need to speak to Samina about getting shoulder and hip bolsters, which can be used to help create a softer feel. But this will be an added expense. I will report back with my findings. Again though, if you hate even medium firmness mattresses, the Samina may not be for you - based on my experience at least! Note: Something I should point out, I don't have the official Samina bed frame, instead I have a slat bed that I have modified to hold the floating slat frame. 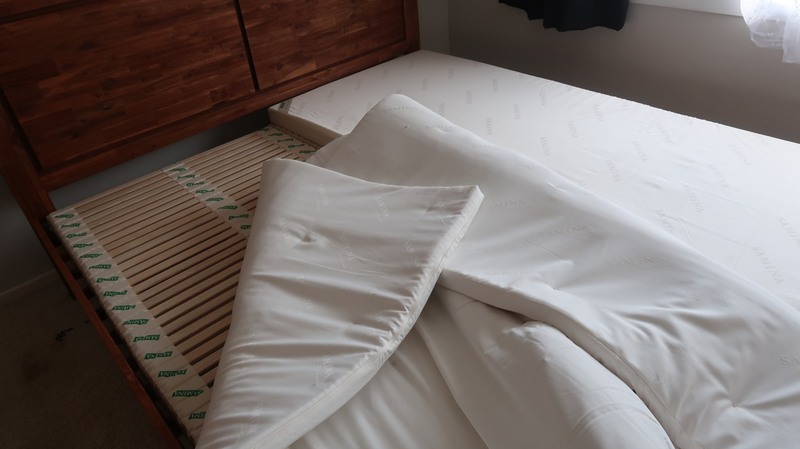 There is a possibility that this is not allowing us to get the full potential out of the samina mattress and could be causing a harder sleep feel. Note #2: I have since spoken to Samina about this, and they said a simple (and free) fix is to remove each second slat on the lower part on the areas she sleeps on. Below I have included images showing how you can remove slats, and the extra support bolster by Samina. I am happy with my investment in the Samina Mattress. I know it is a product that will last me a good 2-3 decades, and in this time I know my wife and I will be sleeping on a bed that is helping us get the best nights sleep possible. Sure people will argue that 'you could have gotten something low in toxins for half the price', but this is no different to arguing that one should buy spray free produce over more expensive organic produce. Sure both crops will be free of pollutants, but the organically grown produce has been farmed in a way that is free from all chemicals, fertilisers and genetically modification - leaving you with a product that is much higher in nutrients. I view the higher costs of eating well, and buying products such as the Samina mattress as an investment in my health, a insurance policy so to speak. I know good quality food will nourish me and not poison me, helping me fight off disease in the future. And I know the Samina bed - something I will spend over a 1/3 of my life on - is going to help me get quality sleep in a toxin free environment. If you crunch the numbers, the price of sleeping in my Samina is less than $2 a night. Split the bill between your partner and you're under a $1 each a night. This makes the financial decision a no-brainer. If I went to bed every night and had the choice of paying a dollar for less partner disturbance, better air flow, quality spine support, and sleeping on natural materials - would I pay it?! Hell yes, who wouldn't. You're spending the money on your sleep and health. 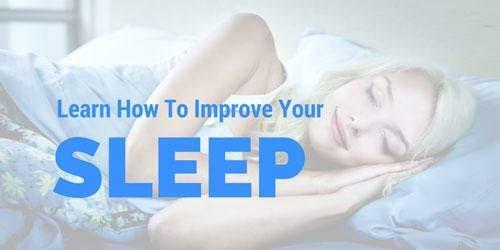 Quality sleep may be the best thing you can do to improve your health, and your health may be the biggest thing determining your quality of life in the future. A huge retirement fund is worthless if you're on your death bed the day you collect it. So yes, the Samina is an investment. An investment for those who value their sleep and their health. Now that we have covered the financial side of the summary (which for most people is the main hurdle to overcome if they are looking at buying a Samina), what about everything else? Well like I have covered in this review - having less partner disturbance is a biggy for me, along with good temperature and humidity regulation. 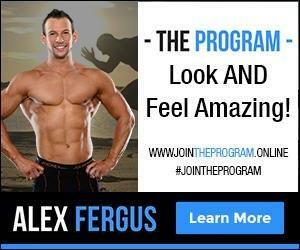 Samina does both of these exceptionally well - and based on the research I have done, Samina does this better than any other product on the market. The fact that it's made from quality natural materials and is 100% free of metals just puts the cherry on the cake. In all honesty, it was quality materials and metal free design that I was primarily seeking when I set out to look for a mattress to buy (read my full report in How To Choose A Toxin Free Healthy Mattress) . The low partner disturbance and heat regulation were the added bonuses that came with the Samina solution. And those added features were enough to convince me to fork out the cash and make the investment into my sleep and health. The only negative I can report on is the firmness of the mattress. Though I have adapted, my partner still noticed this every now and then. But it's my understanding that you can purchased extra supports for the hips and shoulders to help with this. I will keep you posted on this. Though in fairness, my wife continues to happily sleep in our Samina every night, and has also noticed the added benefits of less 'elephants in the bed' and of course she is happy sleeping on a no-toxin mattress.